DIN Standards are invented for a variety of components including industrial fasteners as DIN 557 Square Nuts. DIN 557 Nuts are manufactured from Acid-Resistant Stainless Steel Grade A2 or A4, Brass, Alloy Steel, Ordinary alloy steel, Aluminium or many other materials. DIN 557 Square Nuts are available in a wide range of sizes, shapes and materials. DIN 557 are Square Nuts in the form of a groove. One end of the DIN 557 Nut is flat, the other has a section in the form of a flat ring for making between the outer edge of which and the facets a chamfer is made. The Part has no sharp angles at the joints of the side of the nuts. 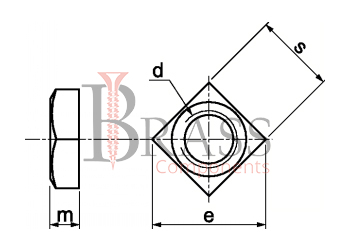 A Steel Nut has a bevel and belongs to the class of product C.
The Groove ensures the fixation of the nut in a fixed position, ex. Prevents the nut from swivelling in the detachable connection when the bolts, screws or studs are tightened to the appropriate thread size and pitch. 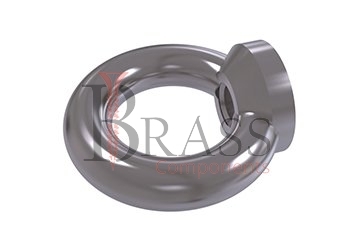 Pre-Installed in a groove prepared in advance with a width slightly greater than the distance between the lateral faces of the nut. Then the counterpart is twisted into the same size, pitch and thread tolerance field. Spring stops are positioned so that they are engaged over the edge of the groove. Used for fastening parts and assemblies in conjunction with bolts, screws and other fastening elements in instrument making, production, mechanical engineering and other industries. Used as a conventional fastener. Provide the most durable and reliable fastening and connection. We manufacture DIN 557 Nuts as per Custom Specification and export in Finland, Jersey, Spain, Switzerland, Ukraine, Austria and other European Countries. For more Information, Please Contact Us or Inquiry Now.